Princess Tessy of Luxembourg and Prince Louis took the decision of divorce and that decision was announced to the public. 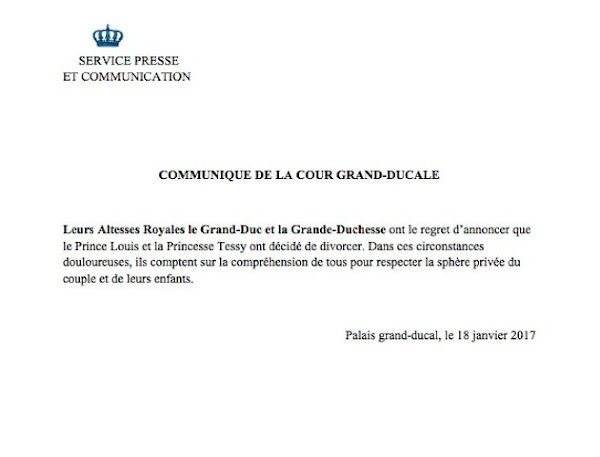 The Grand Ducal court announced on 18 January 2017 in a press release the divorce of Princess Tessy and Prince Louis. The Grand Ducal court announced the following in the press release. "Their Royal Highnesses the Grand Duke and the Grand Duchess regret to announce that Prince Louis and Princess Tessy have decided to divorce. In these painful circumstances, they rely on the understanding of all and ask to respect the privacy of the couple and their children." Princess Tessy and Prince Louis married in 2006. shortly after their first son, Prince Gabriel, was born. Their second son, Prince Noah was born one year later. Ohhh thats so sad! I hope they continue to be civil with each other for the sake of the children and hope they get some privacy. Sad news. There is no joint custody in Luxembourg apparently. One parent gets full custody with visitation rights set up. I have read this is a very civil agreement so hopefully the children will have two happy homes. Still unfortunate news. I wonder if they will follow Luxembourgian Law or UK Law since that is where they reside. The divorce was heard in the UK. I can't find anything dated after January of 2017 about how this was resolved, but it was very troubling that in spite of his behaviour being a bit scary in court, that people in the Internet seem to be against her. I guess some people are just so starry -eyed over royal people that they will always choose one born a Prince over a "Commoner". I have seen no photos of him with the children, but there were some nice ones of her with the boys in the UAE on vacation. Does anyone know how things stand currently? A bad beginning of the new year for the Luxemburg Royals. Very disappointing! Unfortunately this is becoming the norm for every family. Doesn't come as a big shock if you followed Tessy on instagram. She spent Christmas alone in Florida with the children and would post photos of herself with the kids and have strange captions about how they were alone again. Same thing for new year, it was just her and the kids. When people started asking questions about where Louis was and why she was posting like that, she started posting pics of him with the kids and saying how he was a great father. She has now deleted her account on instagram. Wow, this was a shock.. I did not see that coming. How very sad, I am sure this was a difficult decision. My sincere apologies if I'm speaking out of turn here, but wasn't there some concerns expressed about Tessy and Louis getting married to begin with? Another marriage that did not last. How sad. But I'm afraid there is something really bad going on here, it's not just that they grew apart. I would have never said this before you put it out there but I thought it was weird that Tessy and Martha Louise were partying right after ML's divorce announcement. I thought as fellow royals living in the UK, Tessy was being a good friend. Probably a stretch but I thought it was a red flag. But after seeing those beautiful royal pics of Tessy, husband and kids I dosmissed it. Sad indeed. I think this is a very extrapolated conclusion. The majority of my friends got married young or very young, some of them due to an unexpected pregnancy and actually only one couple of them ended divorced. Oh, wait, they weren't that young when they married (around 28 both) and the pregnancy wasn't unexpected since she fell pregnant very much on purpose. I bet there's some commenter here who could say the exact opposite. That is, divorces happen irrespectively of the age, skin colour, religion, sexual orientation, movie or food preferences. not true, al my friends are married very young or due to a pregnancy, and most of them are still married. Triste notícia... infelizmente mais um casamento que não dura para sempre :((. Always sad to hear of a couple divorcing, especially when there are children involved. We can but hope things are as amicable as possible for all concerned. Very unexpected news! They all pose happy and well but who knows how they really live... many of them are very miserable.. Very sad. Tessy grew into her role as a mother and Princess, but it appeared as though Louis didn't didn't grow into his role as a father (too young perhaps), however that is only an opinion from the outside looking in. Hope they are happier once Divorced. It will be interesting if the Grand Ducal Family let Tessy keep her title. I agree very much with "it's me" ( sorry, my name is Vail). I think Tessy was the "grown up" , she was successful in many ways, she had a real job. Perhaps that upset him, but he did yell at her during divorce proceedings. One hopes he is not like Prince Ernst of the Bad Temper!